Oxford Bible (Biblia Sacra Latina, Versio Vulgata). England (Oxford); Middle 13th Century. Latin Text; Angular Gothic Script. It is usually difficult to dinstinguish the miniature or portable Bibles made by the young Dominican friars in England from those written in France. At times the colophon tells us that a book was executed in the Sorbonne, the newly founded school of theology in Paris, or in the University Center at Oxford. The Dominican order was founded in 1216 A.D. and soon spread all over Europe. About 1219 A.D., King Alexander of Scotland met St. Dominic in Paris and persuaded him to send some members of his brotherhood to Scotland. From here they spread to England. The original master text was carelessly transcribed again and again. It may even have been incorrectly copied from the Alcuinian text written for Charlemagne. Therefore, "correctories" had to be made. 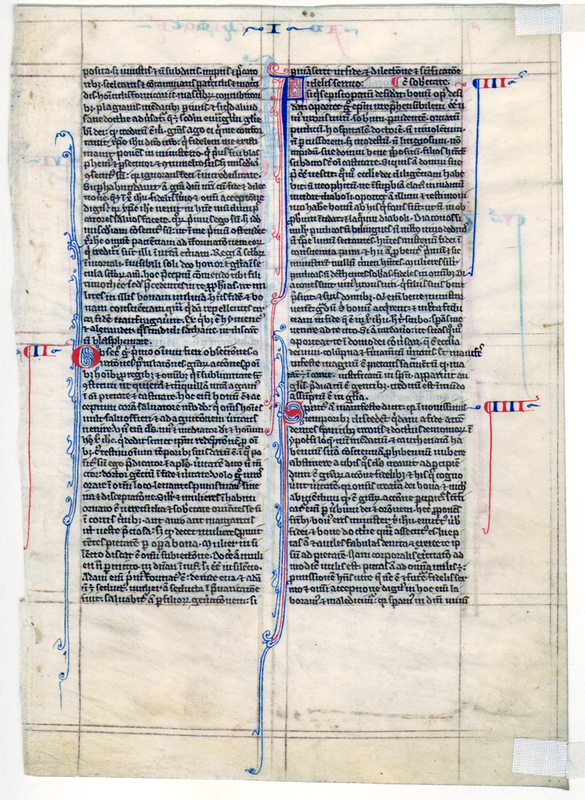 In the latter part of the 13th century, Roger Bacon condemned unsparingly manuscripts which, although they were skillfully and beautifully written, transmitted inaccuracies of text. Observations: The vellum of this leaf is fine, thin, and supple, with no yellowing. The leaf is lined in brown ink, with brown ink for the text and decorations in red and blue. There is no illumination. The initials are flourished, and book name and chapter numbers are also done in color. Text: 1 Timothy 1:9-4:10 (recto) and 4:10-6:19 (verso). ...the just man, but for the unjust and disobedient, for the ungodly, and for sinners, for the wicked and defiled, for murderers of fathers, and murderers of mothers, for manslayers, 10 For fornicators, for them who defile themselves with mankind, for menstealers, for liars, for perjured persons, and whatever other thing is contrary to sound doctrine, 11 Which is according to the gospel of the glory of the blessed God, which hath been committed to my trust. 12 I give thanks who hath strengthened me, even to Christ Jesus our Lord, for that he hath counted me faithful, putting me in the ministry; 13 Who before was a blasphemer, and a persecutor, and contumelious. But I obtained the mercy of God, because I did it ignorantly in unbelief. 14 Now the grace of our Lord hath abounded exceedingly with faith and love, which is in Christ Jesus. 15 A faithful saying, and worthy of all acceptation, that Christ Jesus came into this world to save sinners, of whom I am the chief. 16 But for this cause have I obtained mercy: that in me first Christ Jesus might shew forth all patience, for the information of them that shall believe in him unto life everlasting. 17 Now to the king of ages, immortal, invisible, the only God, be honour and glory for ever and ever. Amen. 18 This precept I commend to thee, O son Timothy; according to the prophecies going before on thee, that thou war in them a good warfare, 19 Having faith and a good conscience, which some rejecting have made shipwreck concerning the faith. 20 Of whom is Hymeneus and Alexander, whom I have delivered up to Satan, that they may learn not to blaspheme. 1 I desire therefore, first of all, that supplications, prayers, intercessions, and thanksgivings be made for all men: 2 For kings, and for all that are in high station: that we may lead a quiet and a peaceable life in all piety and chastity. 3 For this is good and acceptable in the sight of God our Saviour, 4 Who will have all men to be saved, and to come to the knowledge of the truth. 5 For there is one God, and one mediator of God and men, the man Christ Jesus: 6 Who gave himself a redemption for all, a testimony in due times. 7 Whereunto I am appointed a preacher and an apostle, (I say the truth, I lie not,) a doctor of the Gentiles in faith and truth. 8 I will therefore that men pray in every place, lifting up pure hands, without anger and contention. 9 In like manner women also in decent apparel: adorning themselves with modesty and sobriety, not with plaited hair, or gold, or pearls, or costly attire, 10 But as it becometh women professing godliness, with good works. 11 Let the woman learn in silence, with all subjection. 12 But I suffer not a woman to teach, nor to use authority over the man: but to be in silence. 13 For Adam was first formed; then Eve. 14 And Adam was not seduced; but the woman being seduced, was in the transgression. 15 Yet she shall be saved through childbearing; if she continue in faith, and love, and sanctification, with sobriety. 1 A faithful saying: if a man desire the office of a bishop, he desireth a good work. 2 It behoveth therefore a bishop to be blameless, the husband of one wife, sober, prudent, of good behaviour, chaste, given to hospitality, a teacher, 3 Not given to wine, no striker, but modest, not quarrelsome, not covetous, but 4 One that ruleth well his own house, having his children in subjection with all chastity. 5 But if a man know not how to rule his own house, how shall he take care of the church of God? 6 Not a neophyte: lest being puffed up with pride, he fall into the judgment of the devil. 7 Moreover he must have a good testimony of them who are without: lest he fall into reproach and the snare of the devil. 8 Deacons in like manner chaste, not double tongued, not given to much wine, not greedy of filthy lucre: 9 Holding the mystery of faith in a pure conscience. 10 And let these also first be proved: and so let them minister, having no crime. 11 The women in like manner chaste, not slanderers, but sober, faithful in all things. 12 Let deacons be the husbands of one wife: who rule well their children, and their own houses. 13 For they that have ministered well, shall purchase to themselves a good degree, and much confidence in the faith which is in Christ Jesus. 14 These things I write to thee, hoping that I shall come to thee shortly. 15 But if I tarry long, that thou mayest know how thou oughtest to behave thyself in the house of God, which is the church of the living God, the pillar and ground of the truth. 16 And evidently great is the mystery of godliness, which was manifested in the flesh, was justified in the spirit, appeared unto angels, hath been preached unto the Gentiles, is believed in the world, is taken up in glory. ...who is the Saviour of all men, especially of the faithful. 11 These things command and teach. 12 Let no man despise thy youth: but be thou an example of the faithful in word, in conversation, in charity, in faith, in chastity. 13 Till I come, attend unto reading, to exhortation, and to doctrine. 14 Neglect not the grace that is in thee, which was given thee by prophesy, with imposition of the hands of the priesthood. 15 Meditate upon these things, be wholly in these things: that thy profiting may be manifest to all. 16 Take heed to thyself and to doctrine: be earnest in them. For in doing this thou shalt both save thyself and them that hear thee. 1 An ancient man rebuke not, but entreat him as a father: young men, as brethren: 2 Old women, as mothers: young women, as sisters, in all chastity. 3 Honour widows, that are widows indeed. 4 But if any widow have children, or grandchildren, let her learn first to govern her own house, and to make a return of duty to her parents: for this is acceptable before God. 5 But she that is a widow indeed, and desolate, let her trust in God, and continue in supplications and prayers night and day. 6 For she that liveth in pleasures, is dead while she is living. 7 And this give in charge, that they may be blameless. 8 But if any man have not care of his own, and especially of those of his house, he hath denied the faith, and is worse than an infidel. 9 Let a widow be chosen of no less than threescore years of age, who hath been the wife of one husband. 10 Having testimony for her good works, if she have brought up children, if she have received to harbour, if she have washed the saints' feet, if she have ministered to them that suffer tribulation, if she have diligently followed every good work. 11 But the younger widows avoid. For when they have grown wanton in Christ, they will marry: 12 Having damnation, because they have made void their first faith. 13 And withal being idle they learn to go about from house to house: and are not only idle, but tattlers also, and busybodies, speaking things which they ought not. 14 I will therefore that the younger should marry, bear children, be mistresses of families, give no occasion to the adversary to speak evil. 15 For some are already turned aside after Satan. 16 If any of the faithful have widows, let him minister to them, and let not the church be charged: that there may be sufficient for them that are widows indeed. 17 Let the priests that rule well, be esteemed worthy of double honour: especially they who labour in the word and doctrine: 18 For the scripture saith: Thou shalt not muzzle the ox that treadeth out the corn: and, The labourer is worthy of his reward. 19 Against a priest receive not an accusation, but under two or three witnesses. 20 Them that sin reprove before all: that the rest also may have fear. 21 I charge thee before God, and Christ Jesus, and the elect angels, that thou observe these things without prejudice, doing nothing by declining to either side. 22 Impose not hands lightly upon any man, neither be partaker of other men's sins. Keep thyself chaste. 23 Do not still drink water, but use a little wine for thy stomach's sake, and thy frequent infirmities. 24 Some men's sins are manifest, going before to judgment: and some men they follow after. 25 In like manner also good deeds are manifest: and they that are otherwise, cannot be hid.